More than two-thirds of participants in a four-day online survey that ended yesterday believe Hezbollah, Iran’s cat’s-paw in Lebanon, is the new adversary of Arabs and Muslims. A total of 453,943 respondents (or 72.8%) said yes, compared to 169,605 (or 27.2%) who said no. 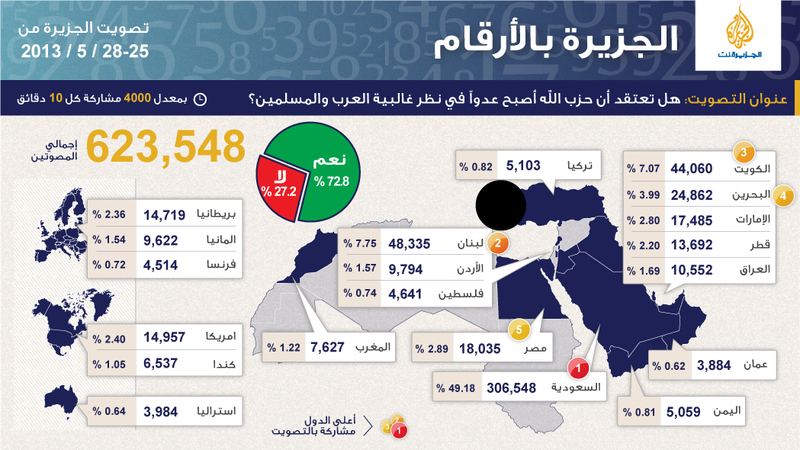 Almost half of the respondents (49.18%) were from Saudi Arabia. The others were from Lebanon, Kuwait, Bahrain, Egypt, Iraq, Qatar, Oman, Yemen, Turkey, Jordan, the UAE, Palestine, Morocco, the UK, Germany, France, the U.S., Canada and Australia. One-question surveys are event driven, allowing respondents to give an immediate response with just one click to an important event. In his televised weekend address to Hezbollah loyalists in Mashghara, Nasrallah said his party would not let Assad fall to the U.S., Israel and the (Sunni) Takfiris. To underscore the Syrian regime’s military alliance with Hezbollah, Assad’s office says he is set to give an interview to Hezbollah’s al-Manar TV channel tomorrow, Thursday. The interview would be broadcast simultaneously on Syria's official television channels at 9 p.m. local time (18:00 GMT), the president's office announced on its Facebook page. Today, member states of the UN Human Rights Council will consider a resolution condemning the presence of foreign combatants in Qusayr, as fighting over the strategic town in Homs province intensifies. The draft resolution, referring to Hezbollah, condemns the presence of foreign fighters siding with the government as a serious threat to regional security. It demands access for United Nations and other humanitarian agencies to all civilians affected by the conflict by authorizing cross-border delivery of humanitarian aid as an urgent priority. Hezbollah seems to be shrugging off the international outcry over its involvement in the Syria war and a 24-hour ultimatum set yesterday by General Salim Idriss, chief of staff of the Free Syrian Army, to end it. Rami Abdul Rahman, head of the UK-based Syrian Observatory for Human Rights, told AFP news agency today Hezbollah has sent extra fighters to link up with Syrian elite Republican Guards troops in the assault on the rebel stronghold of Qusayr. “The preparations indicate they are gearing for a major offensive” on neighborhoods in the north and west of the town the rebels have been holding for a year, he said. “Despite the intense bombardment, the rebels are resisting fiercely,” Abdul Rahman said. He said Sunni militiamen from Lebanon had joined the battle on the side of the Syrian opposition fighters. “The fighting is becoming more and more sectarian (Shiite vs. Sunni) in character,” he added. Strategically placed close to Syria’s border with Lebanon, Qusayr is home to 25,000 people, most of them Sunnis. Syria’s regime is dominated by Alawite Shiites, while the majority of the population is Sunni. Control of Qusayr is essential for the rebels as it is their principal transit point for weapons and fighters from across the border in Lebanon. It is also strategic for the regime because it is situated on the road linking Damascus with its coastal heartland.